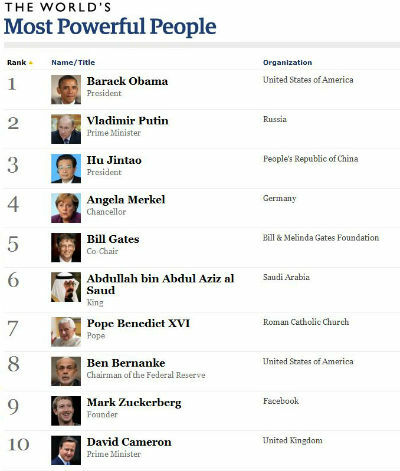 Recently released ranking by Forbes magazine lists ten Muslims among the most influential 70 people in the world. Custodian of the Two Holy Mosques, King Abdullah, was again selected the most influential person among Muslims and the sixth person in all 70 people, due to the location of Islam’s holiest site in KSA and his impressive social reform in Saudi Arabia. Ali Hoseini-Khamenei, the second most influential Muslim, ranked at the 26th position due to his influential character in the Iran affairs. Ali Al-Naimi, the oil minister of the Kingdom that contains 20% of the world’s known oil reserves, is another person ranked at the 31st position. Most of the Muslim influential persons are the head of states or have governmental administration backgrounds. US president Barack Obama regained his position at the top, followed by Russian Prime Minister Vladimir Putin, taking the second position, while Chinese President Hu Jintao has slipped from the No. 1 spot on the magazine’s annual rankings to the third place. Sonia Gandhi (11th), Manmohan Singh (19th), Mukesh Ambani (35th) and Lakshmi Mittal (47th) are other Indians who are ranked as most influential persons, besides the two Indian Muslims, Dawood and Azim Prem Ji. Shafeeq Rahman is a professional researcher on India-centric socio-economic and political databases and can be reached at rahman.shafeeq@gmail.com.